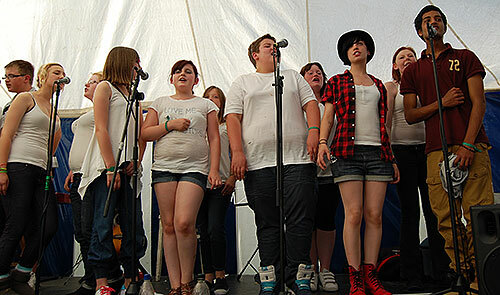 In October last year some of the young people who make up the Freedom Road Collective, Jess, Sammie, Molly, Sammy and Rose where asked to provide the entertainment at an after conference event at the KC Stadium. 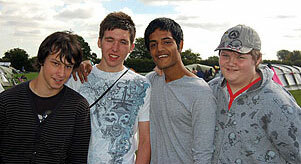 The organiser of the event was so impressed by the talent that night that he asked if the Charity would be interested in organising an Under 18's Acoustic Marquee at Tribfest 2011. 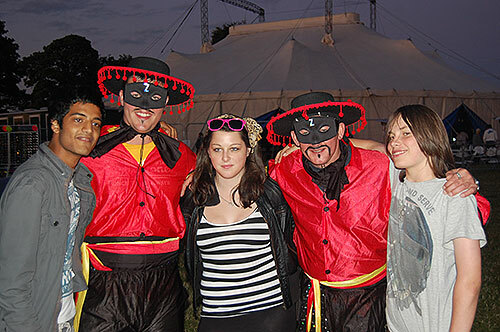 Tribfest, which is hailed as Europe's biggest Tribute Band festival, and which is attended by around 5,000 people, therefore became the focus for our 4th Summer School as we saw it as a great opportunity to do something very new to us all. As well as having the Collective perform at Tribfest we also spoke to several young people who access the Warren and also to young people who are regulars on the Acoustic scene in and around Hull, to ensure that we had a series of top quality performers. By early August the line up was complete and we were ready to start this years Summer School, which as well as providing everyone with a chance to perform, would also provide everyone with a weekend pass to camp over and watch other bands perfroming at Tribfest. On Day 1 and Day 2 (Wednesday 17th and Thursday 18th) the young people of the Freedom Road Collective met at Northern Theatre to work on their sets which they would perform at Tribfest under the watchful eye of Beney who gave tips on performance and Becky, Jack, Emily and Molly of the Monday drama group were also present to start work on some mimes that they would do in order to create an interest in the Marquee and attract people in. As well as the serious work there was also time to enjoy the rehearsals and Sammie, Danielle and Shauna provided us with some comedy routines that had us all laughing, and Sam's mimes gave us a welcome change of direction. Day 3, Friday 19th. We all met at Northern Theatre for 1pm, bags packed and sleeping bags on hand and travelled to Tickton to settle into the palacious accomodation at Tribfets that Mike, Iain, Shobal, Mark and Bobby had built for us, before moving over to the main arena which is where all the Marquees and the Main Stage were situated. 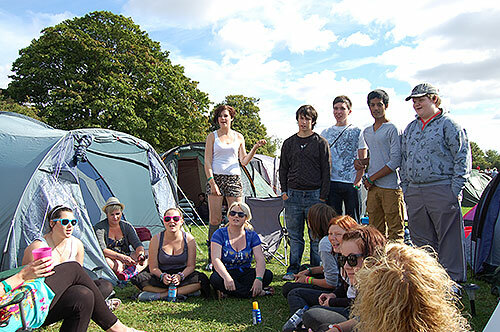 This is where loads of bands and acts would be performing over the weekend. 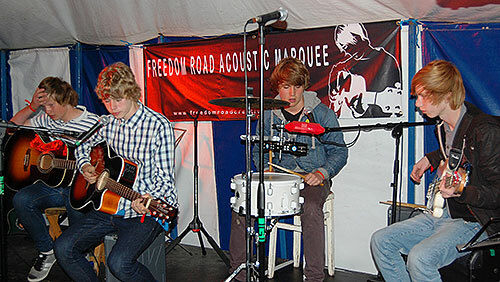 The first performer, in our aptly named Freedom Road Acoustic Marquee, was 14 year old Stevie Mould. Performing songs by Fleetwood Mack amongst others it was difficult to believe that Stevie had only being playing guitar for 4 months and with such a great voice her set was a fantastic opener and set the standard for others to follow. Next up on the Friday was the Collective's Danielle and Shauna, who having rehearsed so much over the past few months, produced a wonderful set with songs such as "Hey Soul Sister" and "Fix You". Having started with us as a duo the girls are now soloists in their own right and are firm favourites with their distinctive styles! 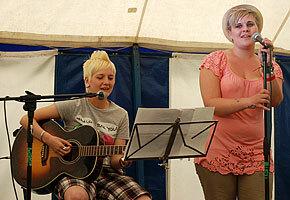 The 3rd act on Friday was Abbie Lammas who is one of the Warrens major artists. Abbie had been in the recording studio earlier in the dayu putting the finishing touches to her new CD which will be out shortly, and it is easy to see why Abbie has such a reputation, with a set of covers and original songs which had our guys watching on in awe! The final act on the opening day was Kat Ombler who maintained the quality that had preceded her with a cracking set of songs, and as day one came to a close, the Freedom Road Acoustic Marquee was making waves as the audiences throughout the evening had steadily grown. So then it was back to the tents for our first night under canvas and by 12.30am it fell almost silent after an exciting day. The only noise that could be heard was from Elle, who had earlier nearly passed out after meeting the lead singer from Metallica tribute band "Mentallica", who had played the main stage, constanly saying "I can't believe he spoke to me, Oh God, I can't believe it"! Morning broke on Day 4 Saturday 20th of the Summer School with the sun shining and the smell of Eggy Bread cooking on the stove. 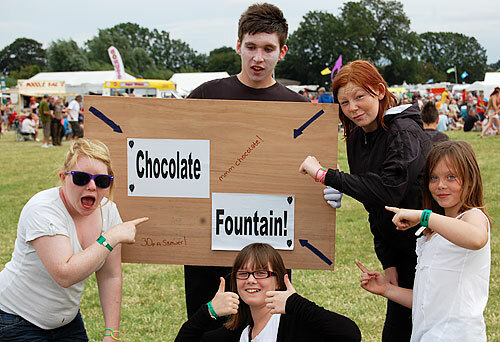 Coffee and tea was also provided as we prepared ourselves to move over to the main arena and set up for another 7 acts in our Marquee, with a sing song of what had now become the anthem of the Summer School, Jessie J's "Price Tag". 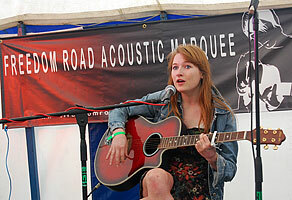 The first acts on in the Freedom Road Acoustic Marquee was Rhiannon Godfrey, closely followed by Sam Arkut. Rhiannon and Sam both perform regular at the Weir Bar in Hessle as part of the growing Acoustic scene and it was very apparant why they are constantly asked back to perform with polished sets. At this point in the day Becky, Emily, Jack and Molly entered dressed as Pop Icons in terrific outfits designed by themselves and Lisa. Emily was Cindy Lauper, Jack Eminem, Becky was Lady GaGa and Molly was Katie Perry. 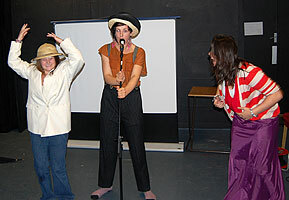 The 4 had spent time developing mimes of each act performing a classic number associated with them outside the Marquee to help create an interest in what we were doing. Added to this was Sam Blackhurst whose mimes enhanced this idea, and all of a sudden the audiences in the Marquee increased. Great idea and well done! Following Rhiannon and Sam was The Collective's Rose Elliot whose fantastic versions of "9 Crimes" and Sandi Thom's "Punk Rocker" amongst other songs saw our first full house with people stopping for Rose's full set. It also demonstrated just why we rate Rose so highly. Brilliant! At 5.15pm The Gleeks took to the stage and after their opening 2 numbers the Marquee was full and rocking again. With all 12 of the Gleeks on stage at one point, Emmy, Olivia, Sally Anne, Toni, Sammie, Luke, Shobal, Elle, Jordan, Celine, Emily and Dione enthralled the audience with their talent and togetherness. Lisa had worked wonders in preparing the Group for Tribfest with outstanding results, coupled with Celine's first ever solo! It made me think that this is exactly why FRCA exists! So how does the next act follow this? Enter Jess and Livi. 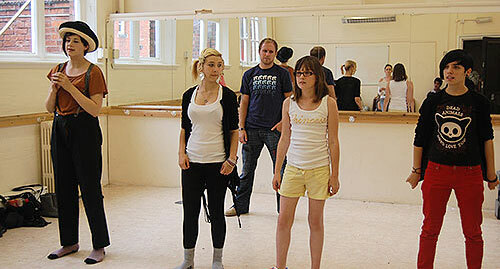 Jess has been part of the FRCA set up from day one and performed on a local, regional, national and international stage with the Charity and it has always been a challenge as to how Jess would develop as she matured as an artist. 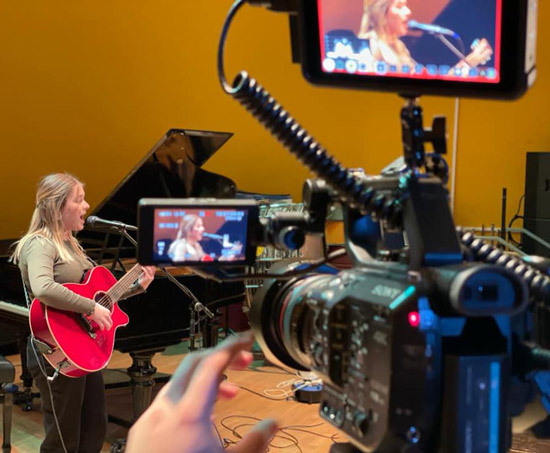 Over the past few months, therefore, Jess has been working with Livi to create her own identity as a singer and performer and this performance at Tribfest was simply superb! The choice of songs, the harmonies and the stage presence were spot on, and with confidence now at a high, hopefully Jess and Livi will keep going and keep working as they have REAL talent! 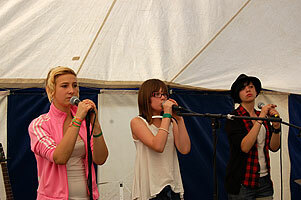 Closing Day 4 was local band Out of Date whose obvious influences include the Arctic Monkeys. With a series of their own songs mixed in with Arctic Monkeys covers, OOD closed the evening on a high with another packed Marquee. The main band on the Main Stage that night was a Take That tribute band, and although I missed it, reports that came back to our Canvas Village told of how Toni got so carried away with the performance that her Air Drumming was classic!! The place fell silent about 1am as everyone was completely shattered, even Sammie was quiet as we all slept in preparation for our final day. We were all woken in the morning by a fresh faced Iain Thonpson, who has spent the night at home watching HD TV and sleeping in a comfy bed. Apparantly Iain has to do some work at home, but we think it's because he was scared of the spiders!!! Tom Kay opened the 5th day Sunday 21st of the Summer School and final day at Tribfest and continued were we left off yesterday with an outstanding set. 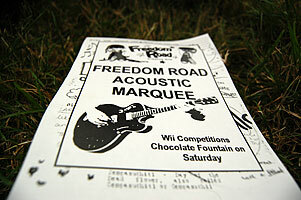 The Freedom Road Acoustic Marquee had by now gained a reputation and Tom's set proved just why. I last saw Tom perform a couple of years ago and he was good then. Today he was very very good showing that the hard work and dedication is paying off. Big things ahead for Tom I reckon!! 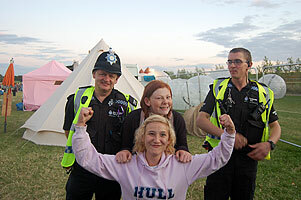 Connie Rawding followed Tom, and it was nice to see Connie being supported by some musicians from an older generation. (I dont feel too bad now). Connie's wonderful set included a version of Ed Sheeran's "A Team", which had become a firm favourite of the performers, and we hope to see more of Connie's huge talent in the near future. 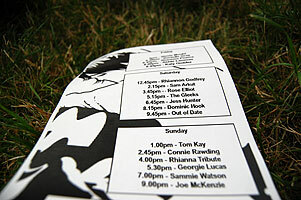 The next Acoustic performer on the FRA Marquee was the Laura Marlin inspired Georgie Lucas. 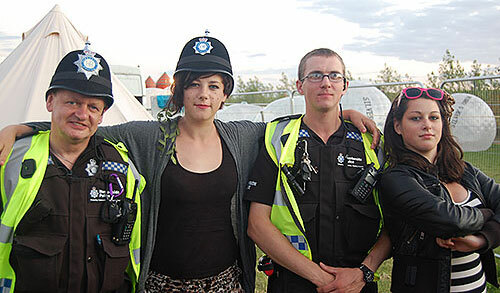 It was really unfortunate that at this point that in the adjacent VIP Marquee a tribute band to Nirvana were playing, and with Georgie's soft style it became a real issue for Georgie to be able to hear herself. However Georgie's obvious talent shone through as she produced a set with beautiful vocals that has the audience spellbound. Our next performer was our very own Sammie Watson. Sammie has found music and singing to be a massive positive in her life, and she is constantly popping into the office to rehearse or ringing to arrange extra sessions. This set of Sammie's was therefore a timely reminder as to how powerful music can be in influencing someones life and giving them a real focus. 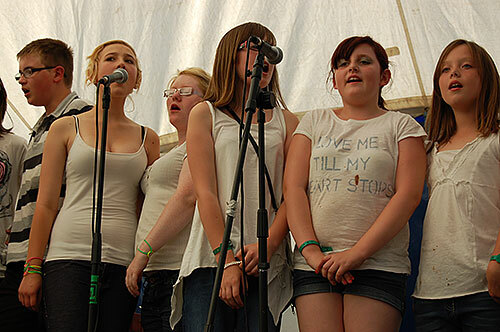 Perfoming numbers such as Adele's "Someone like You" and the Zuton's "Valerie", made famous by the late Amy Winehouse, and being joined by Lou, Danielle and Shauna to perform Price tag, Sammie was just great!! 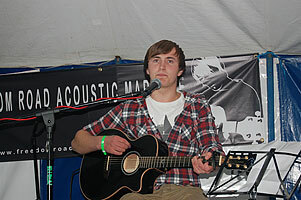 So as the festival drew to a close our last act entered as the Headline Act, (so no pressure then), Joe McKenzie. 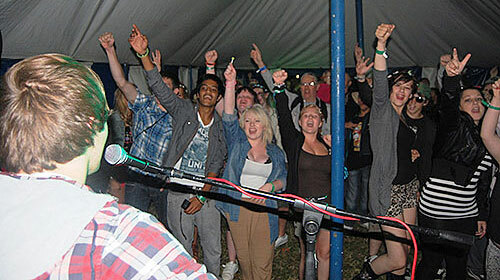 Joe began with a cracking version of "Rewind", which saw the Marquee quickly fill for the final time. Joe effortlessly went through his set, concluding with Price Tag as the audience danced and joined in demanding an encore which Joe gladly provided with . . . . . . . you guessed it "Price Tag"!!!! So that was it. A brilliant, brilliant, enjoyable worthwhile effort made more enjoyable by the young people who attended, performed and above all smiled the whole way through. See you at Tribfets in 2012.